-Lucifer is the god of this world and the only god-Helena Blavatsky. Luke 4,5-6: And the devil, taking him up into an high mountain, shewed unto him all the kingdoms of the world in a moment of time. 1 John 4:4:Ye are of God, little children, and have overcome them: because greater is he that is in you, than he that is in the world. The last verse states: "Greater is he that is in you (God) than he that is in the world". Notice it didn't say "them" but "he" who do you think this "he" is ? Satan of course. Let us also look at 1 Cor 2:12 "Now we have received, not the spirit of the world, but the spirit which is of God; that we might know the things that are freely given to us of God". Lastly, lets have a look at 1 John 3:8:" He that committeth sin is of the devil; for the devil sinneth from the beginning. For this purpose the Son of God was manifested, that he might destroy the works of the devil". He that commits sin is of the devil because the devil sins from the beginning the Bible says. As long as we live in sin we are under the influence of the devil. Man needed to rely on this Breath (God's spirit ) for guidance. He also needed to submit to it in order to reflect it. As soon as man chose to rebel and ate from the tree, he changed and became aware of himself and his nakedness (i.e became self conscious instead of God conscious). Notice that the name of the tree:" the tree of knowledge of good and evil "is exactly what satan promised Eve when tempting her to of eat it.He said thus to her (paraphrased):"when you eat of the tree of knowledge of good and evil, you will become like gods, "knowing good and evil" in other words, you will be conformed to the tree, you will know good and evil. God did not make man to know good and evil (be a law to themselves) God made man to have eternal life and be submissive to him and his laws (symbolized by the tree and breath of life). So many people teach that God lives in humanity and that we are made in his image is this true? How can God be the God of a terrestrial and rebellious creation? If we bear God's image, it means that God must be a mortal and a sinner and that is impossible 1 John 3:10 says: "In this the children of God are manifest, and the children of the devil: whosoever doeth not righteousness is not of God, neither he that loveth not his brother". If we are not of God then who are we of? From the verse above, we can see that the children of the devil do the lusts of their father. They love lies (Reject the need for God in their lives and prefer to live a life of sin) They also hate the truth bringers (Christ and his Church like satan does) Anyone who hates the truth and all that Jesus represents is of the devil. Also 1 John 3:8 which I've quoted previously states:"He that committeth sin is of the devil".....; Anyone who commits sin is of the devil and bears his image. The tree of knowledge of good and evil is the satanic spirit that lives in humanity. It is the light (This light is darkness because it blinds us from seeing the true God) by which the natural man sees by. The natural man only sees the self (and the consciousness that rules self), only lives for self and at the end of the day if he doesn't repent, he dies without ever seeing God. That is why Jesus said in John 3:3: "Jesus answered and said unto him, Verily, verily, I say unto thee, Except a man be born again, he cannot see the kingdom of God". Notice He says see "the kingdom of God". Without dying to the serpent nature and being reborn of God's spirit, you cannot see or experience God or His kingdom. All you will see is the present evil system of things and the deceitful possibilities that live inside your cursed and fallen nature. "Deceit is in the heart of them that imagine evil: but to the counsellors of peace is joy.Prov 12:20"
This Serpent spirit is suppressed in various degrees in humanity by God's spirit and his counsel. So the more godly we are, the more the serpent spirit is suppressed in us and eventually dies in us. The less godly we are, the more this serpent spirit is awakened and finally gains control over us. That is why occultists constantly talk of awakening the serpent power in humanity so that satan can be enthroned (you can check up the word Kundalini online if you are want to have a better understanding of it). If God's warning to man was that he was going to die if he ate the forbidden fruit and the death meant God's spirit would no longer reside in man, how come man still has a terrestrial life? It is this life he fooled Eve to accept instead of accepting eternal life and being inhabited by God. Note that he told her :You shall not "surely die" (Gen 3:4). In other words, he meant by rebelling, she would gain a new life and he fooled her to think that this life was equivalent to (or even better than) the eternal life that God offered her . It is this so called 'life' (which is actually death) that he uses to fool humanity into accepting him. If we ever want to live again, we have to realize that without God, we are dead (Eph 2:1). 1 John 5:12:"He that hath the Son hath life; and he that hath not the Son of God hath not life". Satan did not set us free from God as he claimed. He enslaved us to himself and his sinful and rebellious nature. Countless people go to rehab everyday because they cannot stop doing drugs even though they want to stop. Countless people are alcoholics sexual pervs and chained smokers etc against their will. The 1st diagram above is the Universal Emblem of Medicine. 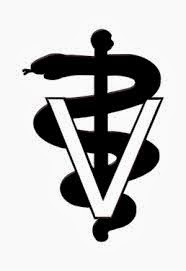 It is called the rod of Asclepius (the god of medicine and healing in ancient Greek religion) and the one to 2nd one is the Universal emblem of Veterinary Medicine. Note that they both consist of a serpent on a rod representing the universal life force. The Dollar sign above is also depicted as the letter "S" (like a serpent) on a pole. The message being passed across by the 1st 2 images is that the healing power and life of this universe is the serpent (satan). The dollar sign symbolizes the fact that satan is the earthly life and sustenance that people work to earn for themselves i.e people work to earn money (dollars) in order to sustain their earthly lives.